Energy Efficiency Alberta is making it easier for small and medium oil and gas companies to reduce methane emissions. 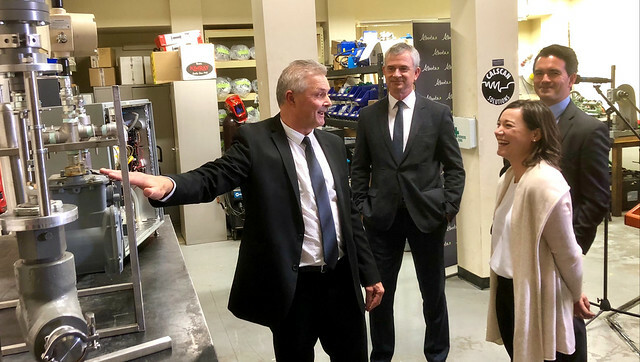 Henri Tessier gives Minister Phillips, Steve MacDonald, and Jackson Hegland a tour of his business’ workshop. The new Methane Emissions Reduction Program will help oil and gas facilities identify, reduce, improve or eliminate methane waste through energy-efficient equipment upgrades, boosting competitiveness, productivity and environmental performance. The total incentive available for facility owners is $250,000 per facility, per fiscal year. The incentives are designed for oil and gas facilities operating in Alberta that do not exceed 40,000 barrels of oil per day. Emissions Reduction Alberta’s Methane Challenge, which invests in research and development of new technologies to reduce emissions. The 12 successful projects are estimated to reduce methane emissions by 6.9 megatonnes by 2030, bring $60 million of investment to Alberta and support 60 jobs. The Carbon Competitiveness Incentive Regulation, which attracts investment in clean technology, protects and creates jobs and diversifies Alberta’s economy. Oil Sands Innovation funding, which invests $440 million in carbon revenues to help large emitters upgrade facilities and processes to reduce emissions and thrive in a carbon-competitive global market. "Alberta’s oil and gas sector is producing real technological innovations when it comes to methane reduction. This program helps industry to field test this new technology in a cost-effective way, so it can make significant reductions in our GHG footprint." Henri Tessier, president, Calscan Solutions Ltd. The climate change impact of methane is 25 times greater than carbon dioxide over a 100-year period. In Alberta, the oil and gas industry is the largest source of methane emissions. Methane emissions in 2014 from Alberta’s oil and gas sector accounted for 70 per cent of provincial methane emissions and 25 per cent of all emissions from the upstream oil and gas sector.